Provost Steven Lerman announced in August that he would resign from his role as provost and accept an endowed professorship. He was the first of six officials to leave their posts this academic year. More than 60 percent of the University’s new tenure-track faculty hires are women — a major signal of the University’s push for gender diversity in its hiring, officials say. 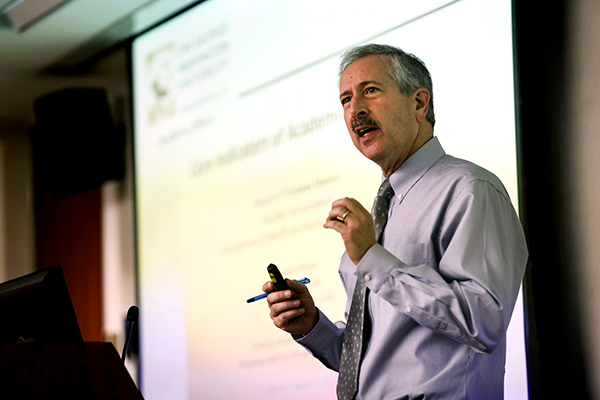 About 41 percent of full-time faculty are women, a nearly 10 percentage-point increase since 2004, according to data from last academic year that Provost Steven Lerman presented at last week’s Faculty Senate meeting. Those hires signal the University’s overall focus on adding more diverse faculty to its ranks, a key goal of University President Steven Knapp’s administration. “We are continuing to grow our women faculty considerably faster than our male faculty,” Lerman said at the meeting. Lerman said that since Vice Provost for Diversity and Inclusion Terri Harris Reed was hired in 2011, the Office of the Provost has pushed departments to hire more female and minority faculty by covering half of their salary for three years with money from GW’s central budget. After the three years are up, the faculty member will be moved into a recently vacated faculty line, Lerman said. The University opens a faculty line when it creates a new faculty position, which determines whether that person will be eligible for tenure. If a faculty member leaves GW, the faculty line stays open until the department hires a replacement or decides to close the line. Lerman said the incentive has gone to between roughly three and six hires for the past several years. But with this year’s University-wide budget crunch, Lerman said it would be “much tougher” on the budget for next fiscal year. Still, he did think it would be possible to continue the incentive. A tenured professor will cost about $2 million over his or her time at GW. A net of about 260 female tenure-track and non-tenured faculty have been added over the last decade, Lerman said. About 921 faculty at GW in 2014 were tenure track, a 24 percent increase since 2004, according to the data. Charles Garris, a mechanical engineering professor and the chair of the Faculty Senate’s executive committee, said he’s seen the atmosphere for female faculty improve over his three decades at GW – particularly since Lerman arrived in 2010. “GW didn’t become a female-friendly place overnight. Now it’s kind of the culture here,” Garris said. Still, Garris said some academic areas – like engineering – struggle to bring in women because there are fewer female engineering professors in the field. He said he has sat on search committees that have reviewed 200 to 300 candidates, with just about 5 percent of the pool being women. “If in a search you do find top-notch female faculty, people are very aggressive about getting them,” Garris said, adding that over the past several years, the mechanical engineering department has added three women to its ranks using funding from the provost’s office. In contrast, the full-time faculty corps in the School of Nursing is entirely female, though officials hope to bring more male faculty to the school. In 2008, the Faculty Senate approved a full semester of paid leave for full-time faculty who were new parents. Peer schools like New York and Boston universities had similar programs in place then. Last year, the University started giving full-time staff six weeks of paid parental leave, according to the University Human Resources website. Having children is one of the greatest challenges women face in the workplace, said Melani McAlister, the chair of the American Studies department and a Faculty Senate member. “Having children is very demanding and takes a lot of energy and time, so navigating that really requires both the flexibility of the faculty member and the department,” McAlister said. She also said that female professors may take on a bigger portion of the “emotional labor” as they form close relationships with their students. Eric Peterson, a diversity and organization development educator at consulting firm Cook Ross, said schools must balance diverse hiring with hiring the most qualified candidates. But Peterson also said that just because one area of faculty diversity is improving doesn’t mean officials should stop prioritizing diversification. “If you’re patting yourself on the back in one area, but you’re not necessarily focusing yourself on those areas in which you need to grow, then that’s a problem,” Peterson said. Men make up about 59 percent of full-time faculty, a 7 percentage point decrease since 2004, according to the provost’s report. Minority faculty in total still make up about 25 percent of GW’s faculty, a number that has changed little since 2011. Building up the pipeline of minority hires can be difficult because only a few spots open up every year and overall the number of female and minority doctoral candidates has increased slowly. “I wish we would move faster,” Lerman said during the meeting. About 14 percent of faculty in 2013 were Asian – a 3 percentage-point increase since 2005. In that time frame, black faculty increased 1 percentage point.